The Chicago, Peoria & Southern is a proto-freelanced model of a typical Midwest class 1 railroad. It runs from Chicago to St. Louis and Memphis. In this version, it represents a railroad that is controlled by the Soo Line in 1958. There are also 15 other railroads represented on the layout as trackage rights and live interchanges at various locations. 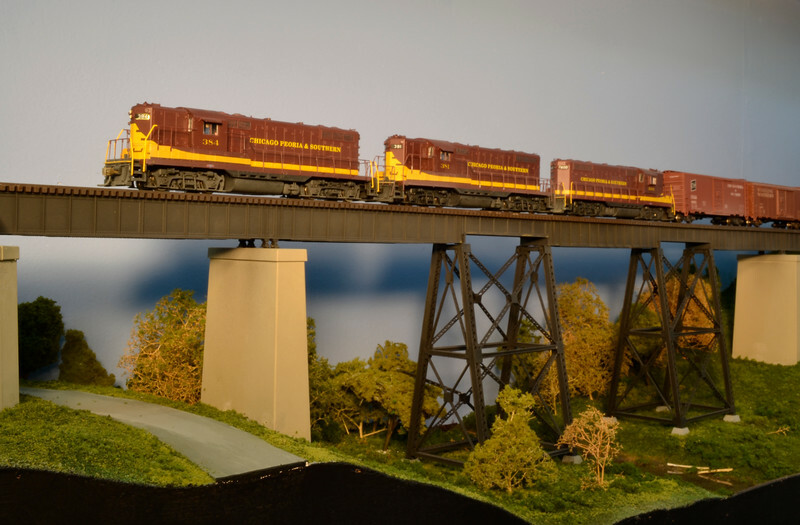 The layout features the main line from Peoria to Venice, Ill., and is 650 feet long. Four working yards handle the switching requirements. Peoria, the largest, Springfield, and Venice primarily handle the merchandise. Litchifield is a coal marshalling yard which dispatches mine runs and assembles coal trains. Six staging yards feed the railroad. The railroad features steam and first generation diesel locomotives. The layout is point-to-point, linear design. Operating sessions are handled by 18–20 operators, including dispatcher, train crews, yard duties, city switchers, and operator. Time table and train orders control train movements, with working train-order semaphores. The South Elgin, Ill., layout was in an "L" shaped basement, overall 60 feet by 37 feet on one end, 26 feet on the other and is double decked. Control was NCE DCC, with wireless control. Track was a combination of code 83, 70 and 55. Scenery was about 80 percent complete. Subroadbed and scenery contours were foam. Minimum mainline radius is 40 inches. Minimum aisle is 36 inches but generally 60 inches or more.